The Rediwa C.A.T 7 system developed by Wandegar 2001 for slim ceramic coating consists, basically, of a longitudinal chemical-elastic fastening of coating on the vertical profile and a mechanical support on which the ceramic coating weight is supported. All existing chemicals included in this system have been tested in approved laboratories, obtaining the highest results according to the TBC. 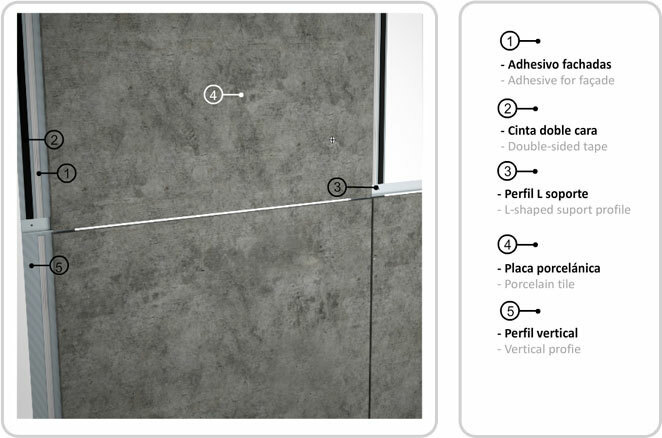 Slim ceramic tiles are reinforced on the back with an adhesive-flexible coat combined with a reticulate mesh specially designed to absorb possible blows or impacts, therefore preventing any possible detachments. The main advantage of the system is that it allows a concealed fastening with no need for mechanisation and it provides an excellent aesthetical look and the highest safety standards.